Yeh Ideology's consulting to large corporate companies means they need innovative, fresh branding. Sometimes it's hard to describe what your company does when buzz words like "innovation" are at the core of your industry. In these cases it's as important to show what you do as it is to tell, and demonstrating your thinking and approach in every word goes much farther than just explaining the ins and outs of your services. 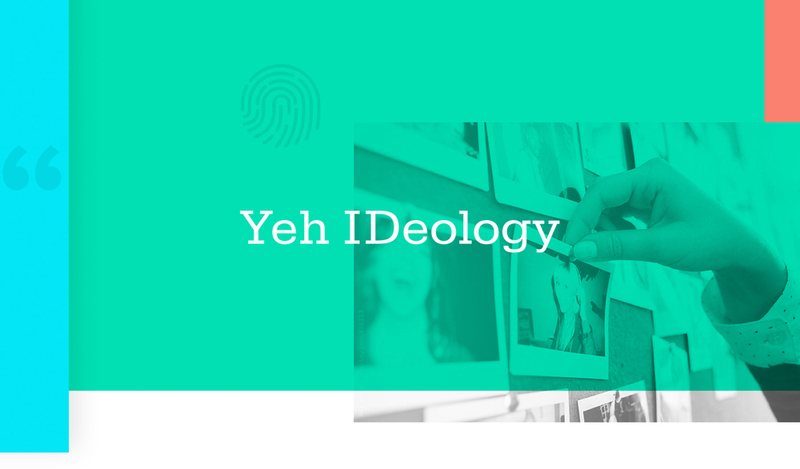 Yeh IDeology had been a recruitment firm for innovation teams for 10 years before making the move into consulting. Their website, while beautifully designed, didn't show off their innovating thinking and approach. The colors, icons and copy made sense when the site was made in the mid-aughts, but with the move to a more elite service came the need for a cutting edge design that shows them off as a premium service. We moved away from icons towards photos of people because their brand is about people! If you're goal is to help companies be innovative, you need to BE innovative yourself! In your approach, process, and how you talk about what you do. Instead of a lot of jargon and buzz words, get real and show your clients what you really mean.